The gazelle is a member of the antelope family. They are usually tan or brown. One type of gazelle, called the Thompson’s Gazelle is brown and white with a black stripe on its face. They are very, very graceful in their movements and they can run very fast. The male gazelles have long, curved antlers. Most of the gazelles are found in the grasslands of Africa and in Southwest Asia. 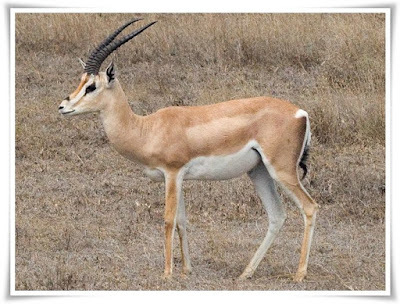 Gazelles eat plants, leaves and grass. Gazelles live in herds, that is groups of them together. When a male gazelle is threatened by an enemy, it will often run very slowly, and then jump very high before it starts to run away. Some gazelle species are now extinct. Some others are now considered endangered and are protected in hopes that the numbers will grow larger.